Join Mandy Frey as she and three friends leave their Amish community in Indiana for the trip of a lifetime to Hawaii. But when Mandy and one of her friends miss the cruise ship after a port of call on Kauai, how will they adjust and get back home? Find out in this brand new romance from New York Times bestselling author Wanda E. Brunstetter, writing with her daughter-in-law Jean Brunstetter. 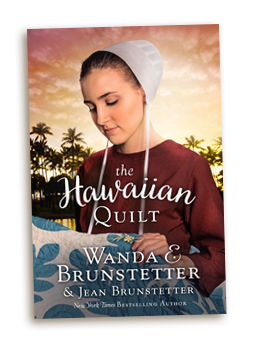 This beautiful collaboration, The Hawaiian Quilt, between Wanda and Jean Brunstetter was amazing! I’m a lover of all things Amish. I’m also a lover of all things Wanda Brunstetter when it comes to Amish fiction novels. I will say, however, that while I love all things Brunstetter, I go into each of her books with an open mind so that if something isn’t up to par on her works, I won’t be let down. I do that with most any author. But, once again, this book hit it out of the park for me. I loved every second of this inspirational romance and the meaning of the quilt. As a granddaughter of a quilter, it was such fun to “see” the quilt come together! I don’t want to spoil this story for anyone so I won’t go into a lot of detail with the plot, other than to say it’s superbly written and highly addictive! But, I will tell you that each and every character within these pages will steal your heart instantly and have you wishing you were right there in Hawaii with them! Mandy and her quirky friends are off on an adventure and land in Hawaii. Each turn of the page is filled with a message that sinks into your heart. It was definitely an interesting experience watching Mandy come to terms with her past and her future. If you are looking for a 5-star, well thought out read, then look no further than this beautifully captivating novel. Another two thumbs up to the queen of Amish fiction in my book! Well done! 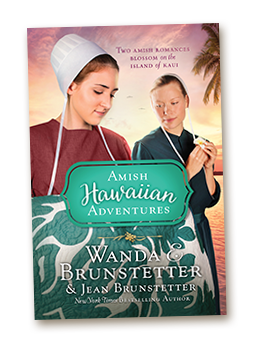 Since my co-author, Jean and I both enjoy visiting Hawaii, and we have an Amish friend who’s gone there, we decided to write a novel with the primary setting on the Island of Kauai. Much of the information about the cruise ship included in our story came from listening to our Amish friend, since that was how she and her friends traveled to the Hawaiian Islands. One of the things she shared with us was how, after they boarded the ship, they were told that it would only stop at each island for so many hours in a day. When it was time for the ship to move on to the next island, everyone who had gotten off the boat to tour must be back on board. If anyone missed the ship, they would be stranded and need to find some other way home or to the next island, as the ship would not return for them. Learning this sparked an idea, so much of The Hawaiian Quilt story revolves around Mandy and her friend Ellen, and how they cope with being stranded. We hope our readers will enjoy the storyline, and that the book will take them visually to the wonderful Hawaiian Islands.